Mary Bayer grew up in Alexandria, Virginia, just outside of Washington, D.C. and studied at Virginia Commonwealth University School of Art in 1971 and 1972. Mary always intended to have a career as an artist, but living on her own she found it necessary to accept other business opportunities. Fortunately, while working in downtown Washington, D.C. Mary was able to continue studying at the Corcoran School of Art. After working many years in government as well as the business community of Washington, D.C., Mary moved to the San Francisco area in 1986 where she met her future husband and then began to raise a family. It was at this time that she was able to pursue her art full time and started working with driftwood and then exploring ceramic sculpture with her husband (and fellow sculptor) in their home studio in El Cerrito, California. 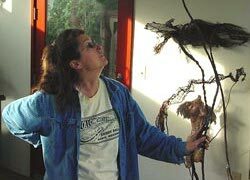 In the years that followed, Mary also began sculptural welding, studying at Contra Costa College in San Pablo, Callifornia. After gaining experience in this medium, she began blending ceramic with metal work and by now enjoys creating many new combined sculptures to exhibit at their home studios and gardens.